Turtle, Owl, Bear, Spirit Animals' Prayer Flag All proceeds to families in Mexico. by Guerilla Prayer Flags at Eny Theme. Hurry! Limited time offer. Offer valid only while supplies last. This prayer flag honors all the creatures that inhabit our planet, beings we have much to learn from as we strive to protect them from ourselves. 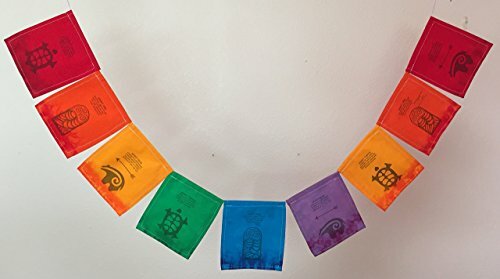 This prayer flag honors all the creatures that inhabit our planet, beings we have much to learn from as we strive to protect them from ourselves. This flag has the following quotes: "Spirit Owl: Intuition, ability to see what others do not. The owl announces a life transition." "Spirit Bear: Strength & confidence. Standing against adversity. Healing self and others. Importance of quiet time, rest" "Spirit Turtle: symbol of the earth. Grounded, even in chaos. Determination, persistence. ancient wisdom." The images on this prayer flag are stamped by hand on each bright panel. These prayer flags are made in a small shop in Juarez, Mexico, a city ravaged by poverty and violence. The women in our shop take tremendous pride in producing the best quality prayer flags available at a modest price. They are made of a durable weight cotton poplin so they will not 'scrunch up' or tear in the wind. They are hand dyed with permanent, non-toxic dyes and they last many months outside in wind and rain before fading gradually. Our workshop is part of a community development project run by the Sisters of Charity (proyectosantonino.org), for families with special needs children. This project supports several of these families and ALL of our proceeds go directly to the people making the prayer flags. Each strand of prayer flags consists of nine panels, each 6"-5", and the strand is approximately 54" long. They look great indoors or outdoors!